Save a special place on the Christmas tree for Mrs. Potato Head! With her signature red lips, dainty yellow hat and purse in hand, this fun ornament is sure to delight kids of all ages this holiday season. Made of resin, this Hallmark Ornament measures 2.17 x 2.71 x 1.6 inches. The ornament is ready to hang on your Christmas tree with a hanger attachment. Perfect gift for kids and fans of the classic Mr. Potato Head toy. Hallmark Ornaments celebrate characters from contemporary and classic movies, TV shows, toys and entertainment. Each festive and collectible ornament is perfect for sharing with family and friends. Each purchase includes one lead-free Christmas tree ornament packaged in a gift-ready box. Save a special place on the Christmas tree for Mrs. Potato Head! With her signature red lips, dainty yellow hat and purse in hand, this fun ornament is sure to delight kids of all ages this holiday season. Made of resin, this Hallmark Ornament measures 2.17 x 2.71 x 1.6 inches. The ornament is ready to hang on your Christmas tree with a hanger attachment. Perfect gift for kids and fans of the classic Mr. Potato Head toy. MR. 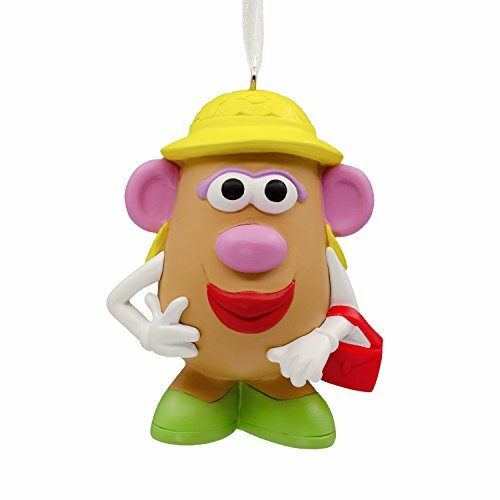 POTATO HEAD is a trademark of Hasbro and is used with permission. 2018 Hasbro. All Rights Reserved. Licensed by Hasbro.